This week, auction volumes are expected to rise with 2,196 properties scheduled to go to auction across the combined capital cities, increasing from last week’s 1,689. Melbourne will be host to the highest volume of auctions this week, with 1,001 homes set to go to auction across the city, up from 792 last week, however Sydney will see the largest increase in volumes week-on-week, with 877 auctions scheduled, up from 592 last week. It is expected that auction activity will increase across Brisbane, Canberra and Tasmania, while decreasing slightly in Adelaide and Perth. Overall activity is set to be higher than what was seen over the same period last year (1,876). This week, Victoria has the busiest suburbs for auctions, with 17 homes scheduled to go under the hammer in Reservoir, while Kew and Preston are each set to host 16 auctions, followed by Brighton and Craigieburn with 14 auctions each. Last week, the final auction clearance rate across the combined capital cities fell to 73.0 per cent across a lower volume of auctions, with 1,689 auctions held, down from the 74.0 per cent across 2,350 auctions the week prior. Compared to the same time last year, last week’s clearance rate is higher than the 67.7 per cent recorded, however volumes are lower than the 2,230 auctions held last year. Across Melbourne, auction volumes and the final auction clearance rate fell last week, with 77.5 per cent of the 792 auctions clearing, down from the week prior when 1,226 homes went to market and a 78.1 per cent rate of clearance was recorded. In Sydney, the final auction clearance rate fell to 73.8 per cent last week, from 74.3 per cent the previous week, across a lower volume of auctions, with 592 auctions held across the city, decreasing from 811 the week prior. Across the smaller auction markets, clearance rates improved in Brisbane, Perth and Tasmania, while Adelaide and Canberra’s clearance rate fell. Geelong was the best performing non-capital city region last week, with 78.8 per cent of the 41 auctions successful. 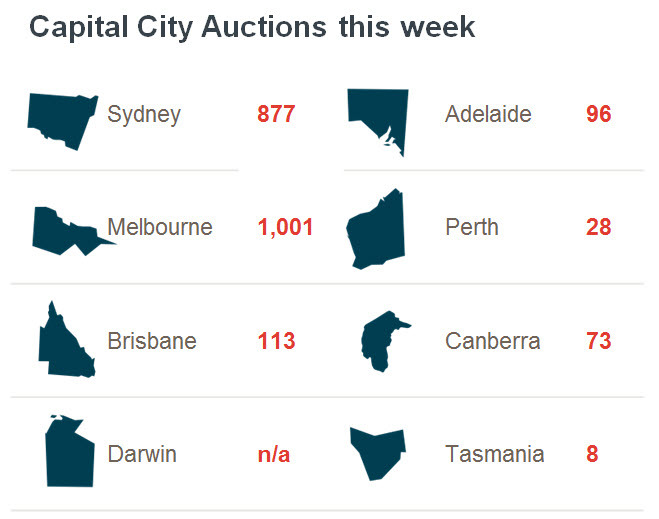 However, the Gold Coast was host to the highest number of auctions (74). ← Holiday Homes: Savvy Investment or No-Go Zone?